My girlfriend Tori and I have a system of playing through games we rent from GameFly: she picks the titles she likes the look of and plays until she hits a snag of tedious or nuanced gameplay. I take over, push through the jumping puzzle/repetitive enemy/otherwise unpleasant experience, then return the controller. Thus, much of my console gaming experiences are now semi-vicarious, and it is through this filter that I will present many of my game reviews. Does this prevent me from providing personal feedback on every aspect of every game? Yes. Does that fact make what I say in my reviews a load of rubbish? Very probable. Will I still charge headlong down the Internet’s twelve-lane superhighway built specially for the transportation of half-informed opinions? With abandon. Eleven years ago a horrific fire took Alice’s family from her and left her mind horrifically scarred. Afterwards she was confined to Rutledge Asylum, where she struggled to confront her demons by slipping further into her fantasy world of Wonderland. Now, after ten years, she has finally secured her release – yet she still bears the heavy psychological burden of that tragic event. With her mind in tatters, she is unable to resolve the fear prompted by her strange memories, dreams, and visions. Perhaps she’ll do better in Wonderland. She always has. She travels there, seeking what the “real” world can’t provide: security, knowledge, and the truth about the past. But in her absence, Wonderland too has suffered. Something has gone horribly wrong, and now a great evil is descending upon what once was her beautiful refuge. Can Alice save Wonderland – and herself – from the madness that consumes them both? The art direction and execution in this game are absolutely fantastic. 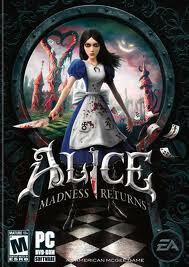 Each stage is unique, atmospheric, and detailed; the monsters are unsettling and grotesque; and the backdrop of a dreary, unfeeling London provides an excellent contrast to the colorful and bizarre machinations of Alice’s tortured imagination. I’m hard pressed to identify my favorite of the game’s many stages because nearly all of them have their own powerful allure. The ones that stick most in my memory, however, are the sky-card world and the Asian-themed world, so I guess I’ll go with those. Tori’s affinity lies with the dollhouse stage, which is certainly a valid contender. Changing Alice’s dress to match each world was a nice touch, and I’m not usually one to care much for costumes. Alice‘s story is surprisingly coherent given the disjointed worlds and events portrayed in the promotional screenshots and videos. American McGee takes what he likes from Lewis Carroll’s original works and morphs them into a new creature all his own, giving Alice a new history and new reasons for delving into the nightmarish depths of her psyche. Set some years after her initial foray into Wonderland, old familiars flit, lumber, and slither their way through the game, speaking to her as one would to an old acquaintance whom one doesn’t entirely trust. This adds an uneasiness to the story that never quite fades, leaving the play unsure of what The Hatter or the Red Queen might do at any moment. 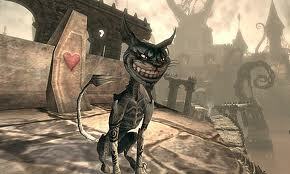 The one (most unfortunate) exception to this is Cheshire Cat. Despite the powerful intrigue his character commands in the original work, he ends up occupying Orlando Bloom’s spot in The Lord of the Rings films: stating the obvious for the slow kids. 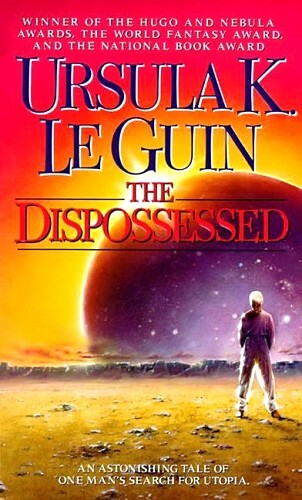 By game’s end, I was dreading his all-too-frequent appearances and bits of inane dialog. Alice’s weakest link is its gameplay: fairly standard platformer fare, which is something of a rarity on this generation of consoles. Combat is fun but fairly predictable, a few of the enemies are repetitive and awful enough to warrant profanity, and the range of weapons is very limited. The invisible platforms (only visible when Alice pops her shrink juice) could have been removed at no great loss, and I could clearly feel projected developer aggression while racing to beat some of the timed puzzles. A few bugs popped up from time to time in the X-Box version as well, namely tiny Alice falling through platforms, which is very surprising given the game’s high production value. Overall, though, I’d easily recommend this game for fans of visual splendor and an interesting take on the Wonderland mythos. Smaller doses are recommended, though, as it can wear thin during marathon sessions. Ars Technica recently published their impression of The Secret World’s gameplay demo at New York Comic Con. A fair review of the footage revealed, but some of the comments make me wonder how familiar the reviewer is with the MMO genre. I’ve read other articles in years past poking fun at the world of MMOs saying that the genre can become a parody of itself when a game takes itself too seriously, and I have to say I agree. By nature, MMO lore and questing challenge the suspension of disbelief; no village could possibly need 100 adventurers to each kill 15 boars a day. Pirates do not capture the same high-ranking officer’s daughter every five minutes. Demons and demi-god don’t respawn at regular intervals. Bad guys and good alike may have vapid lines they like repeating, but not twenty times in a three minute encounter. We get that. The silliness is part of the enjoyment for many, and the myriads of comics on the subject prove this. Why, then, is it pertinent to point out these flaws in this game, a product of the 15 years of trope and tradition that came before it? None of the flaws pointed out in the review are unique to The Secret World. Ragnar and his team have managed to shed a lot of the cliches that have plagued the genre over the years, creating a new and (in my opinion) exciting interpretation of a fantastic genre. 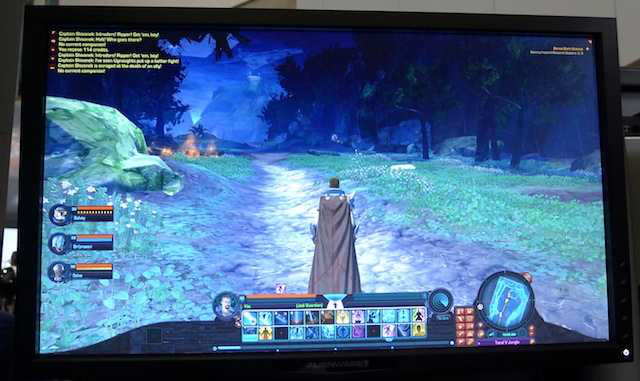 The AT review of Star Wars: The Old Republic‘s demo was far more positive despite the game doing no more than introducing the ME dialog wheel to a WoW-in-space motif. Heretic though it makes me, I admit I haven’t been overly impressed with BioWare’s recent output; I enjoyed ME1 and DA:O, but they did not provide the earth-shattering stories I’d heard about. As such, I can’t understand the hype around SW:TOR, and I’m disappointed that AT is incapable of seeing through the BioWare glitter to see the same flaws they identified in The Secret World.